On the evening of the 9th of June the EU Parliament decided to postpone a crucial plenary vote on the TTIP resolution a day before the vote was to occur. I was in Strasbourg representing Students Against TTIP in the Europe-wide campaign against the toxic trade deal when this snap decision occurred. Myself and other activists from across Europe had already begun planning our action for the morning of the vote when we heard the surprising news: that once again another spanner had been thrown in the works of the great whirring machine that is TTIP. The plenary vote that was supposed to take place was to be on a series of amendments to the TTIP resolution that was voted on in late May this year. Hundreds of amendments were submitted, some focusing on the inclusion of public services in the trade deal, some on food and agriculture regulations, and a few key amendments concerned the ISDS (Investor State Dispute Settlement) clause—a particularly controversial part of TTIP that gives corporations the right to sue governments for any perceived loss of future profit. Similar ISDS clauses have been included in past trade deals, ultimately undermining state sovereignty and the ability of governments to regulate corporations—inevitably leading to private profits reigning supreme over public good. The fact that so many amendments had been submitted for the resolution showed just how decisive the issue of TTIP had become in European Parliament, something that would have not occurred if it weren’t for the dedicated effort of European activists and campaigners who have brought TTIP, a trade deal that could have easily passed by in obscurity, to light—as made evident by a recent petition against TTIP that has already received two million signatures (and still counting)! However it wasn’t just the number of amendments that led to the decision to postpone the plenary vote, as some sources have suggested; there have also been deep divisions amongst the MEPs, especially in the Socialists and Democrats group, regarding TTIP and ISDS. It seemed like it was impossible to form a united block, or maybe there was enough discordance that those who were pro-TTIP, and specifically pro-ISDS, were concerned that the plenary vote would not turn out to their liking. The UK Labour party had a predominantly anti-ISDS stance, as stated by North East MEP Jude Kirton-Darling in a recent video interview, and this could have led to a rift in the Socialists and Democrats block, thus delaying the vote. Theories have been flying around left, right and centre, and as a fledgling activist and outsider to the inner workings of European Parliament the entire process leading up to postponement of the vote seems labyrinthine to me, but what does seem clear is TTIP has undeniably become a very contentious issue. This postponement is a small victory for those who are fighting against TTIP, and highlights just how divisive it is despite the sheer amount of lobbying power and money that has gone into the attempt to actualise it. We may have won, or at least not lost, this battle, but the war between private interests of corporations and the public interests of the people still wages on. 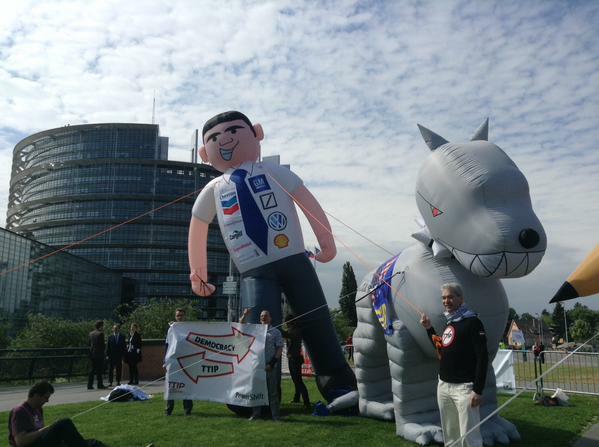 TTIP is just the tip of the iceberg. A trade deal between the EU and the US risks opening the backdoor for the expansion of fracking in Europe and the US, reveals a new report by Corporate Europe Observatory and other groups. As part of the deal currently being negotiated, energy companies could be allowed to take governments to private international tribunals if they attempt to regulate or ban fracking and the dangerous exploitation of unconventional fossil fuels. Campaigners are urging the EU not to include such rights in trade deals. Don’t forget to switch on English subtitles in youtube! Make sure you switch on English subtitles in youtube.